Founder / CEO MaasaiCamel Ltd.
Sicelo Cabangani Mbatha, owner and manager of Umkhiwane Ecotours, was born and raised in the deeply rural area of kwaHlabisa. He is a philosopher, a humanist and conservationist, who is passionate about people and the environment, and believes that connecting with wildlife is critical to the cultural and spiritual health of his community, and of humanity in general. 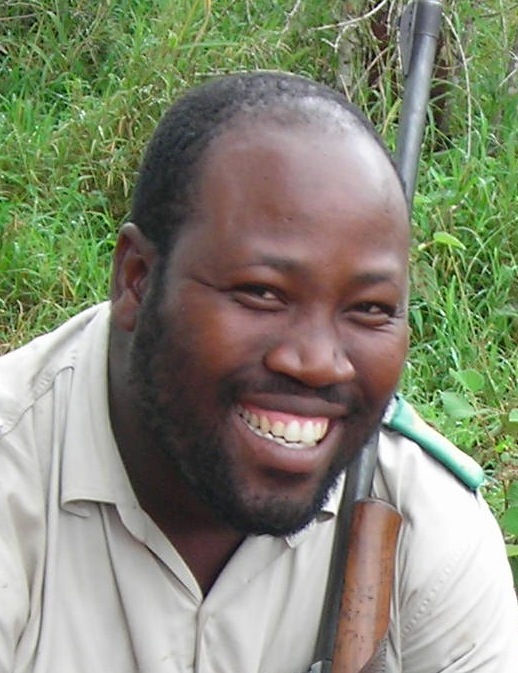 He studied Wildlife Management after matriculating in 1998, then worked as a volunteer for EKZN Wildlife in South Africa, performing various tasks such as black rhino monitoring, lion call-ups, and alien plant control. In 2001 he began training at the Wilderness School to become an official Wilderness Guide. In 2004 he received his qualification in guiding, and began leading his own trails in the Imfolozi Game Reserve, St Lucia, and the Drakensburg. 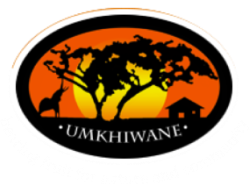 In 2010 he launched Umkhiwane Ecotours with the aim of developing local communities, increasing awareness, and helping to conserve the flora and fauna outside of the protected areas. Umkhiwane Ecotours is currently working with Menzies Aviation and Maasai Camel to help develop rural communities for the benefit of the local people through voluntary team building activities. This has resulted in the building of a local preschool, with a vegetable garden to provide food for the local children, and water troughs for the livestock. This initiative aims not only to improve the quality of life in these communities, but also to ignite a flame of humanity, respect, compassion, positivity, and caring in the hearts of all involved. Sicelo will lead the Ubizo Lwemvelo trails with the help of his close associates at Umkhiwane Ecotours. 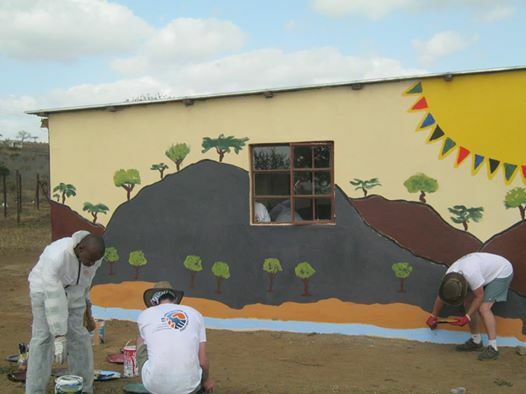 Volunteers help to complete a creche as part of Umkhiwane Ecotours collaborative community upliftment programme. 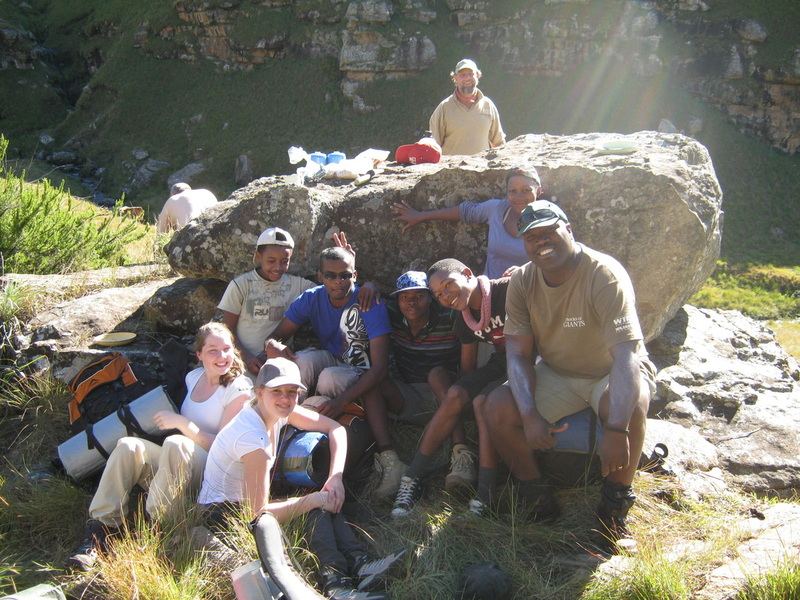 Children from an overseas and local schools on a trail to promote global conservation issues and build relationships on a trail with Sicelo in the Drakensberg. building environmental skills such as brush cutting and alien clearing. It is well placed to provide the logistic support to assist with identifying suitable candidates for the Ubizo Lwemvelo experience, and to support them on sustaining what they have learnt on their return to the community. 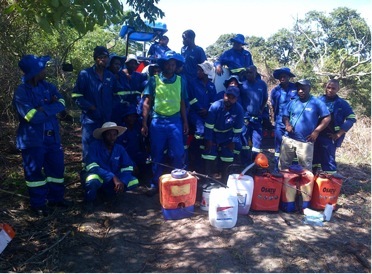 Intokozo is committed to fostering youth development and empowerment.